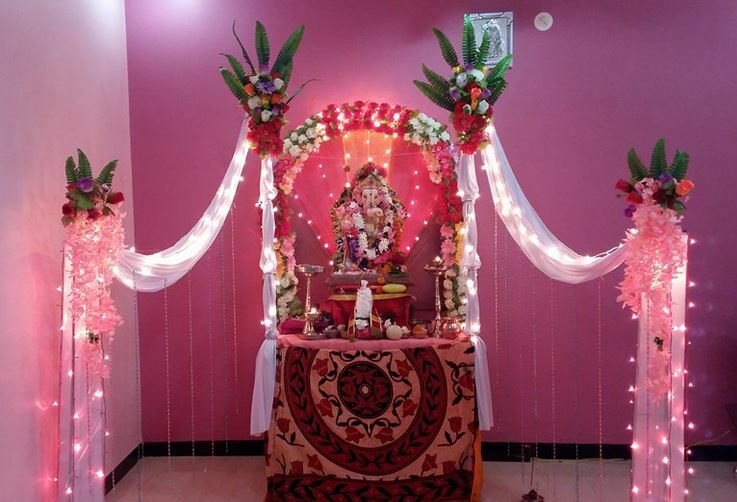 Discover beautiful homemade Ganpati decoration ideas for your house. Ganesh Chaturthi is celebrated once in a year with great enthusiasm. 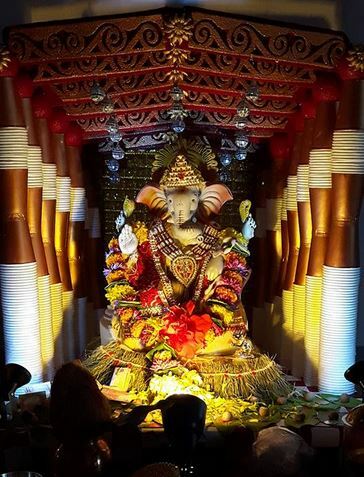 The idol of Lord Ganesh is brought home and the devotees pray for wealth, prosperity and peace. 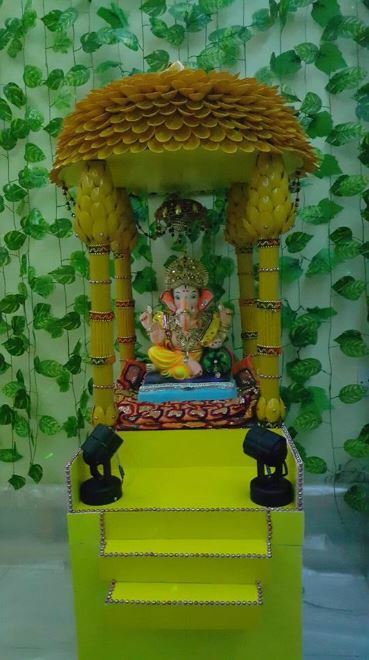 The Ganesh mandap is decorated creatively and beautifully in the house. 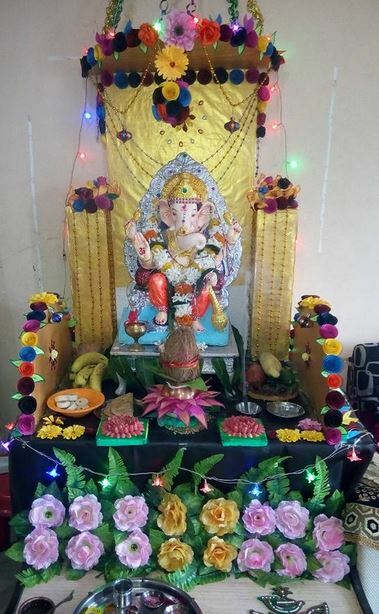 Here are some amazing homemade Ganpati decoration ideas. 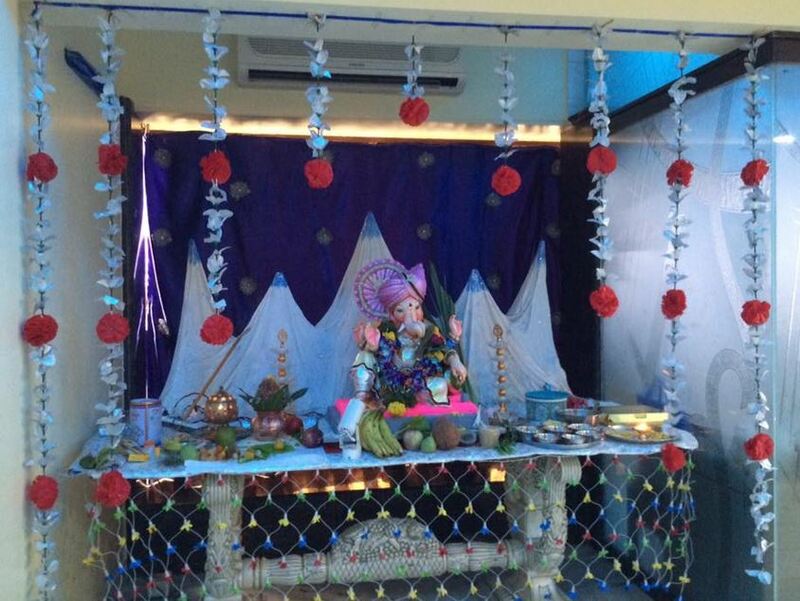 Look at these magnificent homemade Ganpati decoration ideas! The makhar is made of thermocol in attractive fluorescent color. You can place the makhar on a table and decorate the table with lovely pink carnations. The white and red curtains in the backdrop add to the beauty. 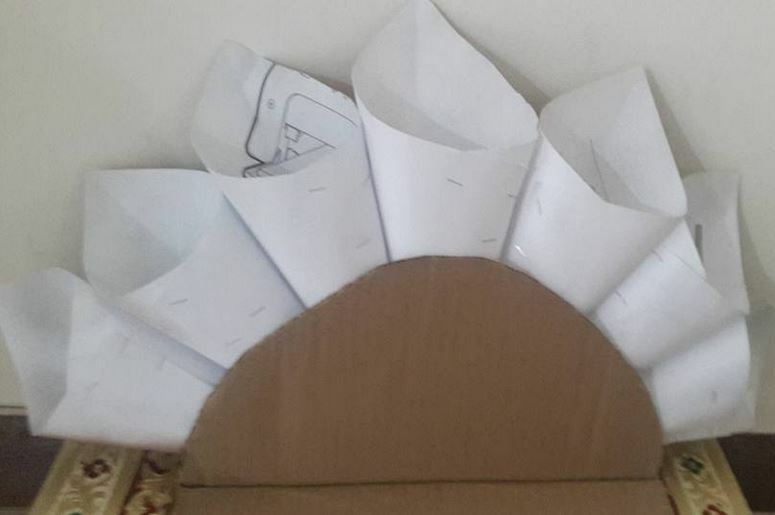 You can make the makhar using cardboard and decorate it with hand-made flowers. Place the makhar on a table and cover it with colorful table-cloth. Decorate the pedestal with colorful artificial flowers and leaves. 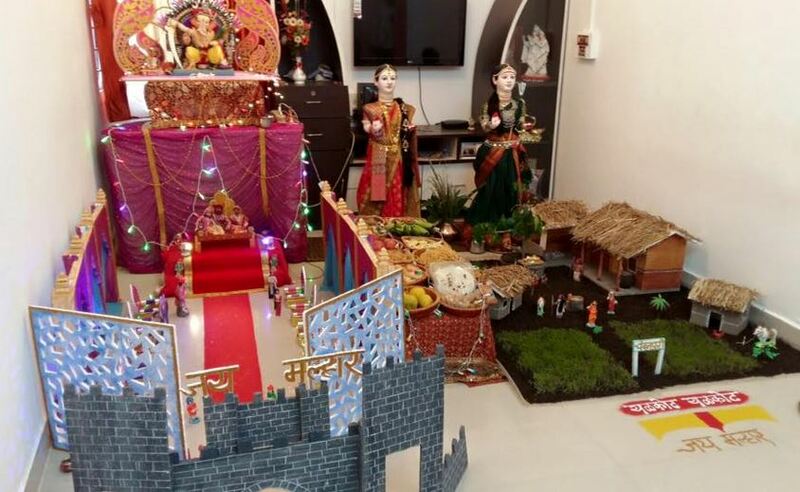 The chief attraction of this Ganpati decor is its simplicity. Do the backdrop with peacock feathers. According to the mythology, Kartikeya, Ganpati’s brother has a peacock as his vehicle. Do up the mandap attractively with orchids and roses. 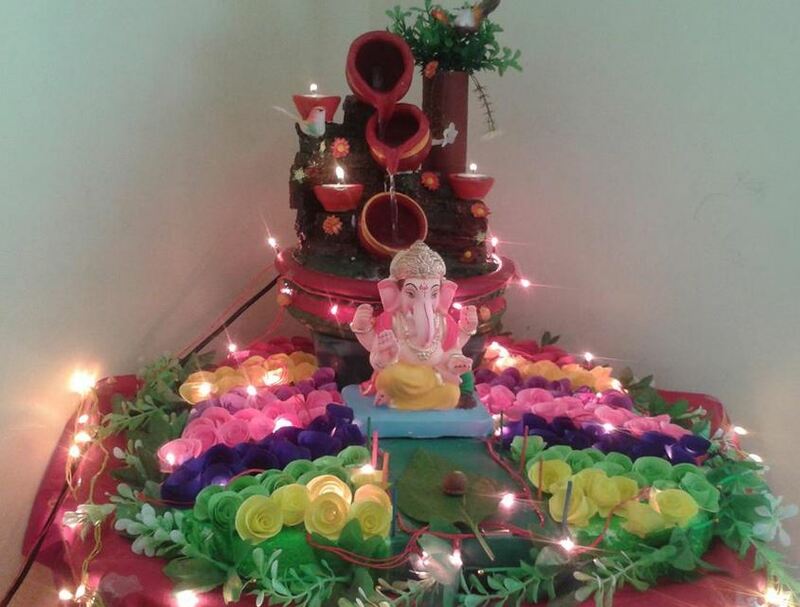 Such homemade Ganpati decoration ideas are a delight to our eyes. The deity flanked with the thermocol peacock that looks awesome. Do the mandap with shimmery streamers against the backdrop of maroon and off white curtains. Place the bhog and the aarti on the pedestal in front of the deity. 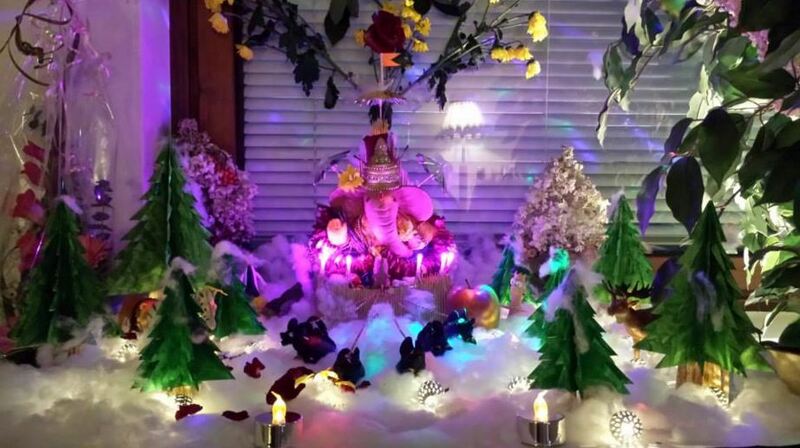 This is a stunningly beautiful idea of Ganpati decoration at home. Place the deity on a pedestal and decorate it with beautiful hand-made flowers. You can make the flowers using fluorescent colored tinted paper. Make lighting arrangement to give the glitz to the beautiful floral view. The fountain kept behind the deity grabs the attention too! Water in Hindu religion is considered to be a purifier and life-giver to all the elements of nature. 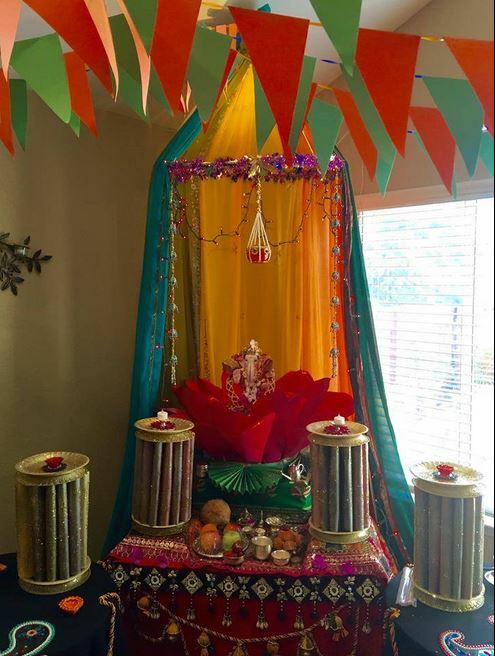 These are some awesome homemade Ganpati decoration ideas. 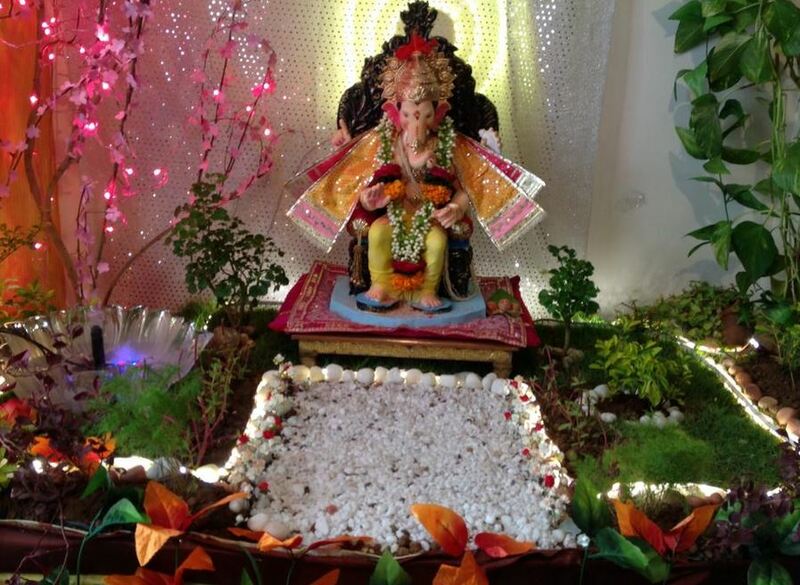 You can transform a corner in your house into a beautiful garden, a place of residence for Ganpati. Do up the garden with artificial flowers and leaves. 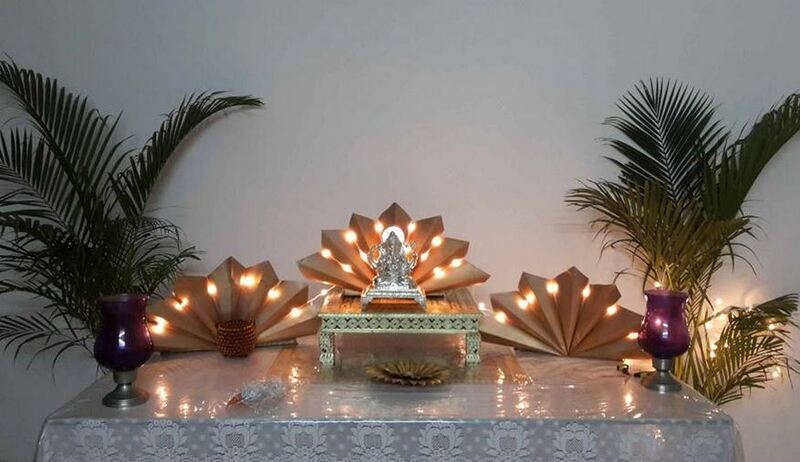 Decorate it with lights and place the deity in this dazzling ambience. 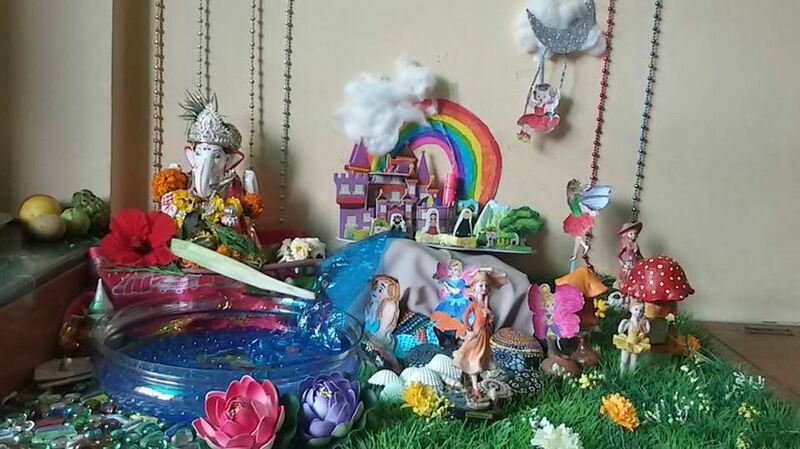 A lovely concept for Ganpati decoration! You can create small conical structures creating snow-clad mountains. Decorate it with artificial flowers and lights. These incredible homemade decoration ideas are feast to the eyes. Stack paper glasses to create pillars and color it in bronze to give an authentic look. Make the ceiling using carved out thermocol sheets. A novel idea indeed! 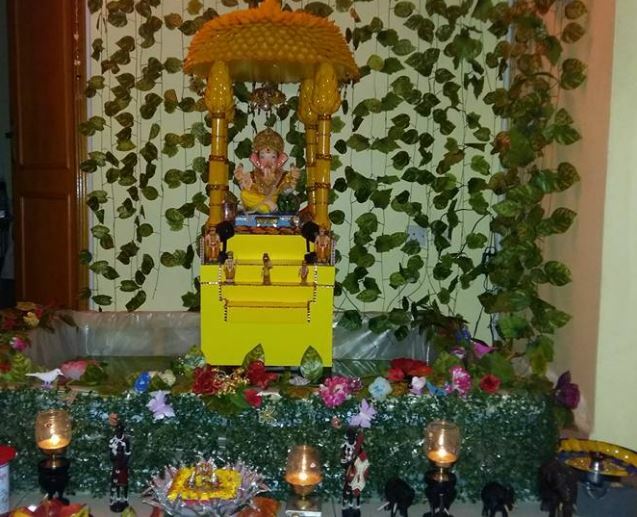 You should appreciate these eco-friendly homemade Ganpati decoration ideas. Make these simple paper cones, arrange and stick them on a piece of cardboard, paint them and illuminate them. Place silver Ganesh on a raised platform and do the pooja. This is a vibrant decoration, carrying a glimpse of Gujarat. Decorate the pedestal with variety of torans. Use bright-colored dupattas to make the mandap and adorn it with streamers. The triangular flags are adding more to the vibrancy. This decoration has an element of fairy land in it. The characters are actually paper cut outs. 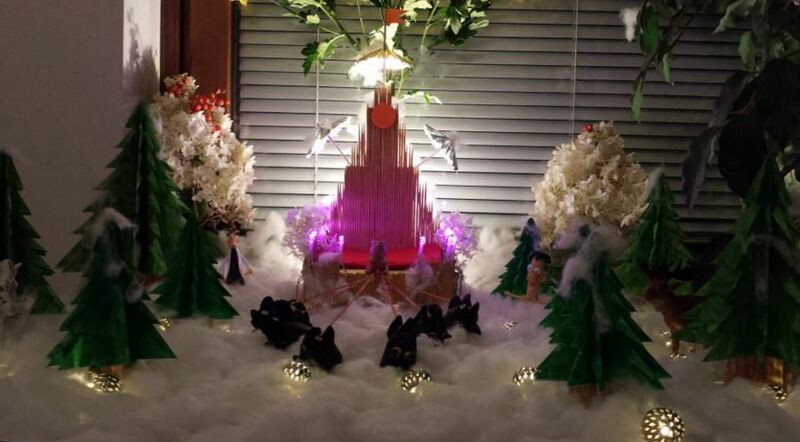 It’s a beautiful creation; kids would love to help you in this decor. A very beautiful and colorful decoration! 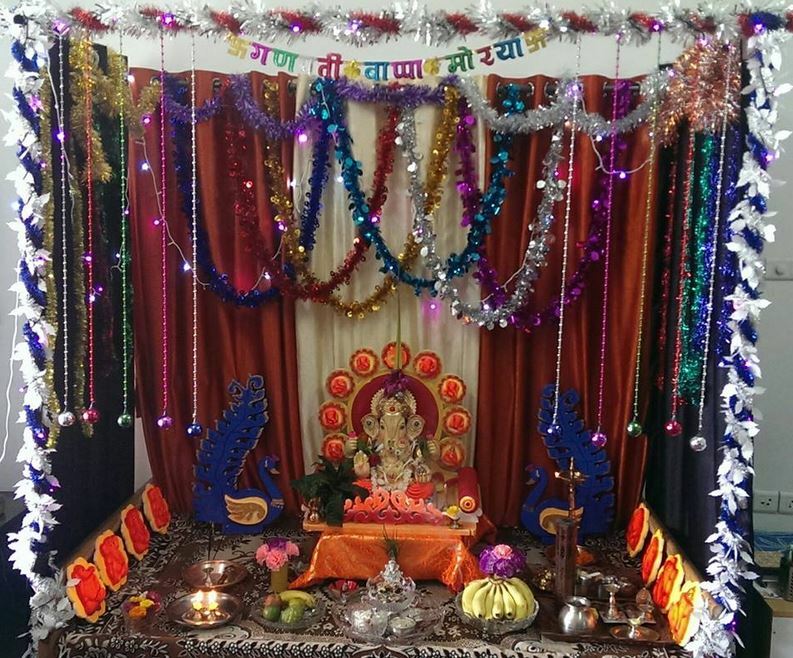 Convert one corner of your house into a small abode for Ganpati. 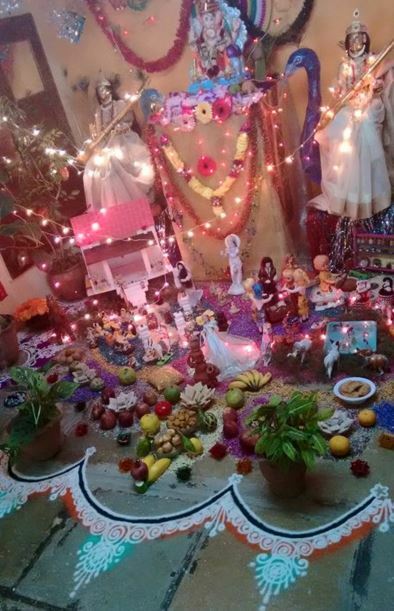 Place the deity on a decorated platform and adorn the area with flowers, fabric and lights. Check out this wonderful miniature village decor. You can make the temple of Ganpati in the vicinity of the village. Use thermocol sheets to make the fence, boundary and even the gate of the temple. The idol of Gauri is also placed in the village. 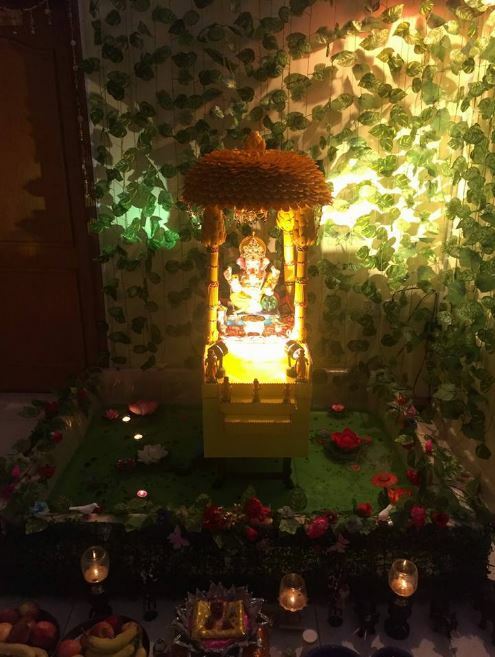 These are amazing homemade Ganpati decoration ideas. You can create the feel of ice by putting cotton and then highlighting it with lights to make it more realistic. Make Christmas tree using card board and place them around the idol. The interesting feature is the mice that seem to pull the chariot of Ganpati. 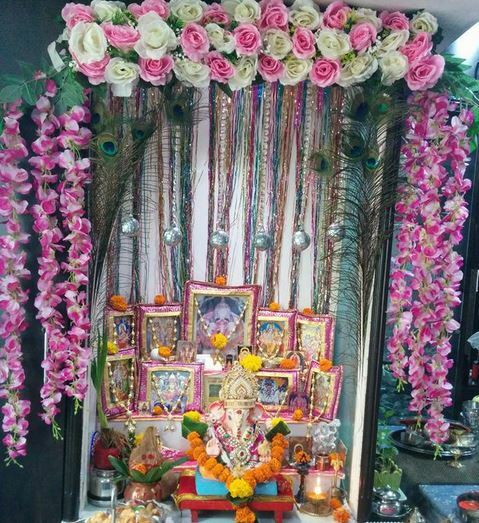 Do this Ganpati decoration in the courtyard or your hall. Create a busy village scene by looking at it. Make pretty rangoli designs on the floor to add beauty to it. Do this neat and lovely decoration in the living room of your house. Use flowers to do up the whole decor. Decorate the ceiling and the floor using marigold, rose, orchids, flowers, petals and leaves. 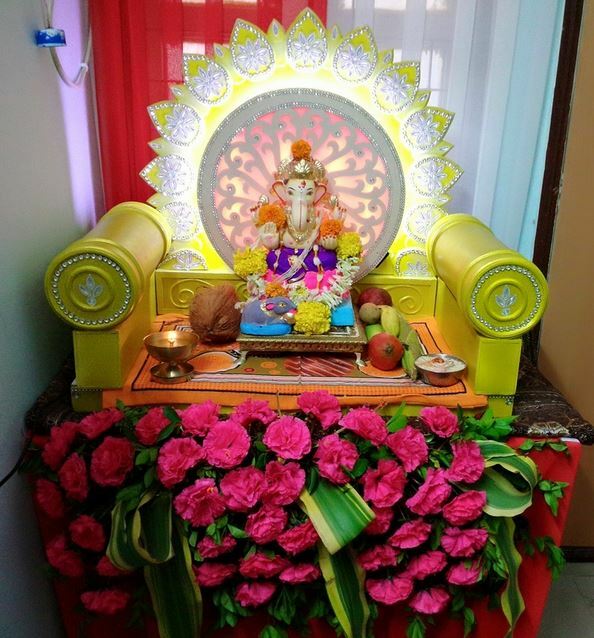 These are breathtakingly beautiful homemade Ganpati decoration ideas. The mandap is made with plastic spoons and the pillars using cardboard. Create the backdrop with green leaves and a pond on the floor. Do try this lovely decoration idea in your home. 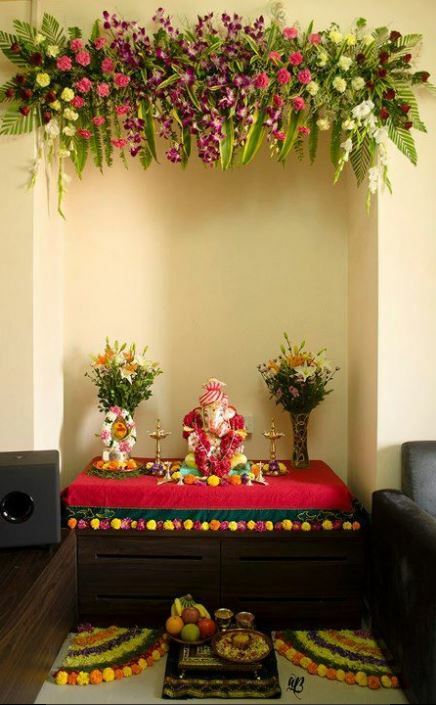 This entry was posted in Decor, DIY Crafts, Pooja Room, Pooja Room Designs and tagged Decoration at Home for Ganpati, Decoration Ideas at Home for Ganesh Chaturthi, Decoration Ideas at Home for Ganesh Pooja, Decoration Ideas at Home for Ganpati, Decoration Ideas for Ganpati, Decoration Ideas for Ganpati Utsav, Decoration Ideas Ganpati, Easy Decoration for Ganpati at Home, Ganesh Chaturthi Decoration, Ganesh Decoration at Home, Ganpati Bappa Decoration at Home, Ganpati Decoration, Ganpati Decoration Ideas, Homemade Ganpati Decoration, Homemade Ganpati Decoration Ideas, Simple Ganesh Decoration at Home by Preeti Sinha. Bookmark the permalink.